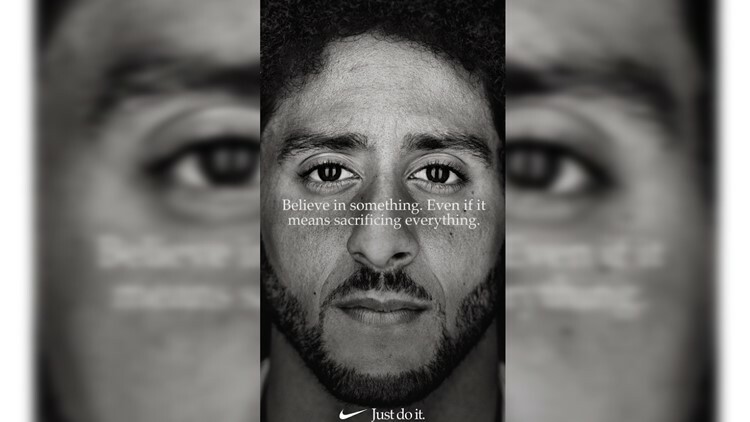 Many reacted to Nike's 'Just Do It' campaign with Colin Kaepernick, but this particular reaction was proven to be false. WARNING: This story contains a graphic image that some may find disturbing. Colin Kaepernick is in the news once again. This time as the new face of Nike’s “Just Do It” campaign. And just like his kneeling in the NFL - this move has folks protesting online. Since Kaepernick tweeted the new campaign image, Monday night, multiple social media users started protesting the move by Nike. Kaepernick's post and the subsequent online reaction show that there are still deep topics and conversations at play. That's why it caught the eye of our VERIFY team when they saw the following post. A Twitter user by the name Phil Braun (@playazball), posted four images in a row Monday night. In the first two, he said he was going to burn his Nike shoes. The next photos appear to show him standing in shoes that are on fire. Finally, the last image is a graphic picture of burned feet with the claim "I am in the hospital." Are these tweets real? Did the man in them actually burn his Nike shoes and put himself in the hospital as a form of protest? 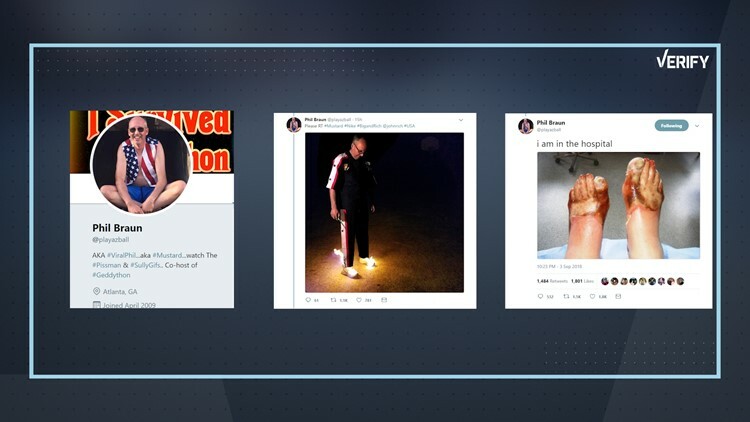 No, while the first photos showing @playazball lighting his shoes on fire are real photos, the photo of burned foot taken from an Australian website and the creator confirmed to VERIFY that this was a satirical post. 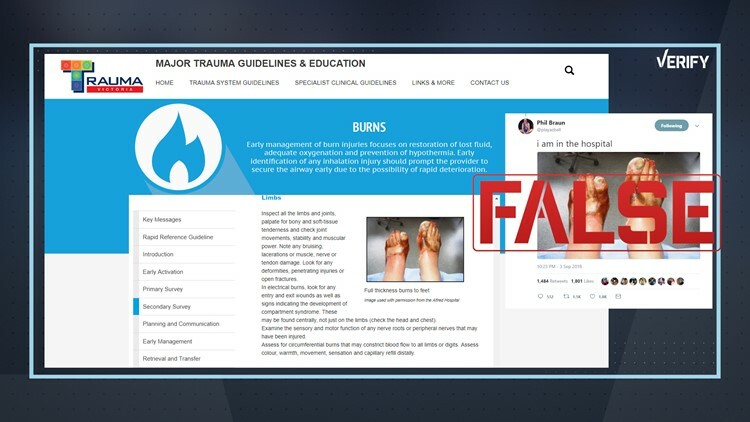 A reverse image search on the photo of the burned foot took our VERIFY team to an Australian website. The picture appears further down the page as an example of "full thickness burns to feet," and gives photo credit to the "Alfred Hospital." We also reached out to Phil Braun directly and asked if the photos were false or real. "The pics of me are real, the feet are not," Braun wrote. "I am doing satire on these protests, & how genuinely dumb people can be when they burn their shoes, destroy keurigs, etc. I fully support Colin Kaepernick's right to protest and think he has a pretty legit reason given the climate of our country...the fact people can't tell it's a joke tells you a lot." We can Verify that the photo is false. People are not burning their Nike shoes while wearing them to protest Nike's choice of Colin Kaepernick.